The last months of the 2m EME activity were marked by problems with the SSPA’s antenna relay and a mechanical failure of the vertical rotor. Unfortunately I missed some very interesting EME-DXpeditions like PJ2T, TD9FYC and CR2EME. After the problems could be solved (many thanks to my friend Karl-Heinz DH8WG for the great work on the rotor), the German DXpedition PJ6E could be logged on Monday April 23 as a new DXCC # 69. 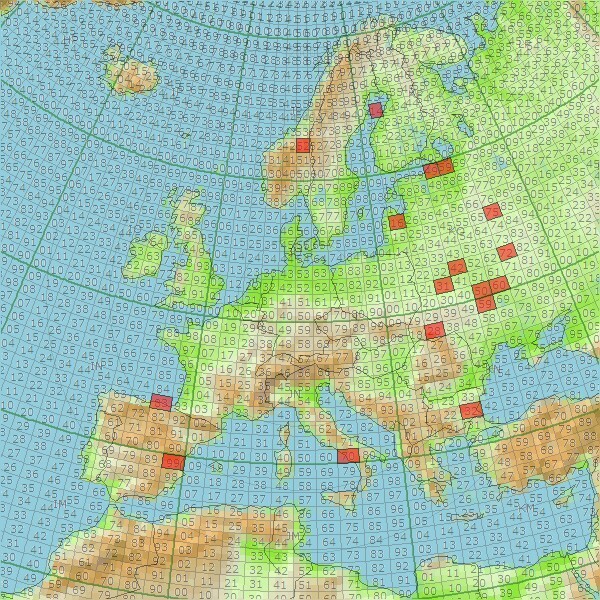 DF7KF and DM1AC had a great signal with only one 14 element XPol antenna. 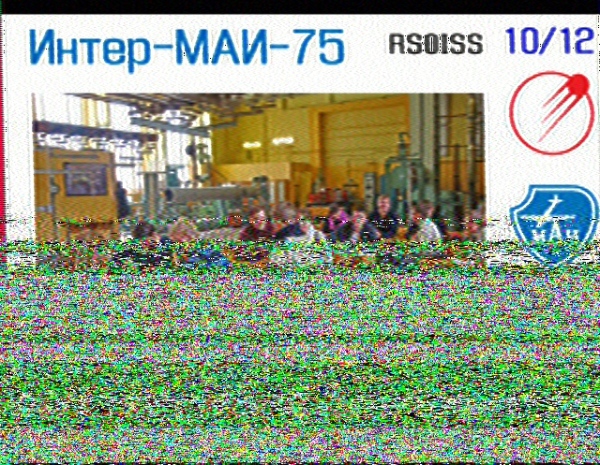 Next was the first known activation from Kosovo on 2m, Z66EME. Uwe, DG8NCO, had several technical problems and with only an 8 element antenna on his side and with a bit of patience he was still good to work – DXCC # 70 for me. On Friday evening, April 27, 2018, 7P8Z from Lesotho was next in line. Bernie, ZS4TX had travelled there for just 2 days and worked more than 100 stations via the moon on the first evening with his 2 x 18 element horizontally polarized antennas. 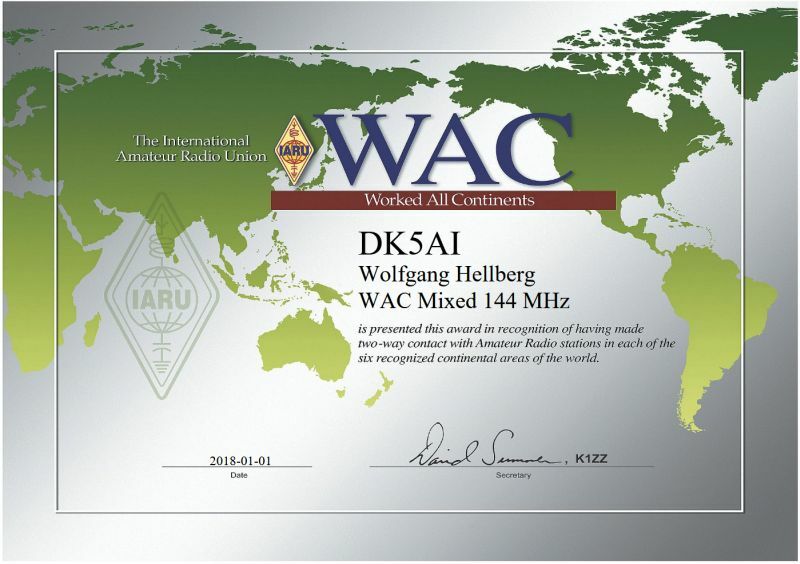 DXCC # 71 could be celebrated. Unfortunately, I missed the Italian DXpedition 3B8MS to Mauritius. 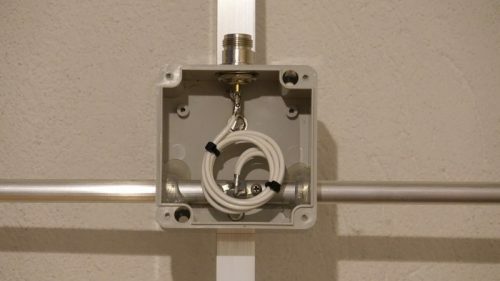 The team had a lot of problems with noise all the time and so only very well equipped stations could be worked from there – no chance for my small single antenna EME station. Beeing active on 2 m since 1973 with an interruption of more than 25 years I finally completed the “144 MHz WAC – Worked All Continents” last December and received the Award today. Many thanks to 3V8ONU (Africa, CW-Meteor Scatter 1979), K1WHS (North America, CW-EME 1982), UG6AD (Asia, Sporadic E 1989), VK5APN (Oceania, JT65-EME 2017) and PY2GN (South America, JT65-EME 2017) for making this possible. Back in 1983, that means 35 years ago, I completed the 432 MHz WAC just with CW-contacts. Now the question is: Which band is next for WAC? 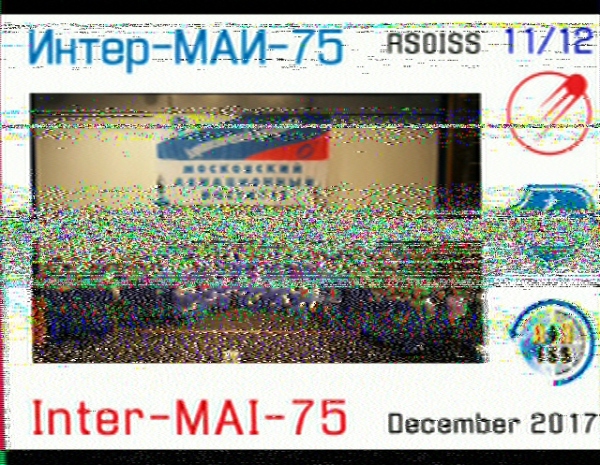 From December 06-08 the ISS again send SSTV pictures. 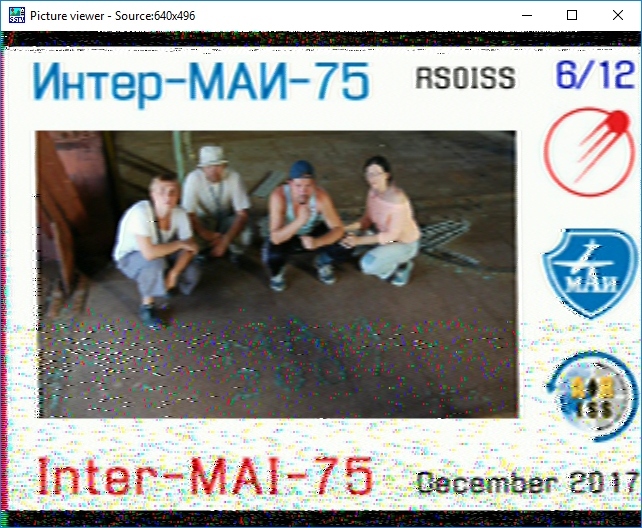 The images are always transmitted in SSTV mode PD 120 on the frequency 145.800 MHz in frequency modulation. 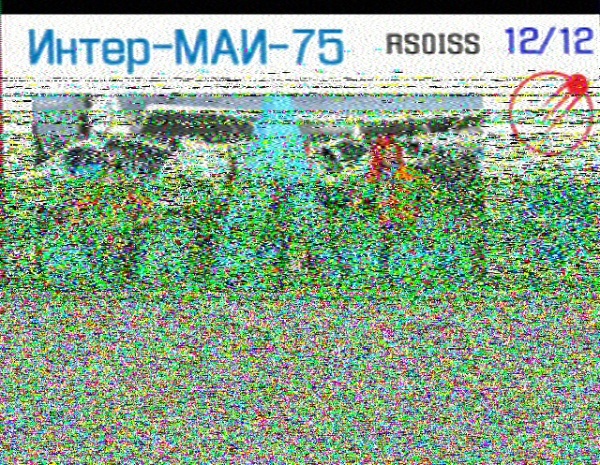 The images were decoded with the MMSSTV software. More information about amateur radio on the ISS can be found on the ARISS website. Last picture was received while ISS was between Crimea Peninsula and Caspian Sea, abt. 2.500 km away. Since I was not active on 144 MHz EME over the last 2 months due to vacations and other commitments, this weekend was a real goal. Conditions were excellent all weekend and Faraday was mostly cooperative. 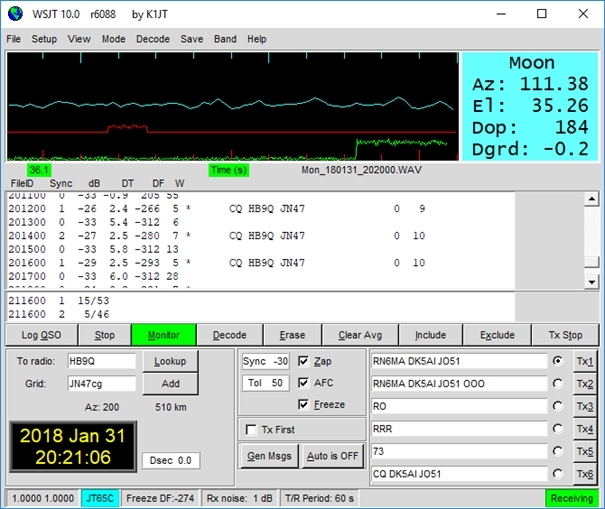 At moonrise on Friday evening I completed a QSO with Australia, a very problematic direction from my location because of manmade noise at low elevation angels. Wayne, VK5APN, gave a new DXCC, new ODX with 15.528 km and finally the last missing continent Oceania. The second new DXCC this night was RA9CHL in the asian part of Russia. On early Sunday morning, a QSO with the German one-man DXpedition V31EME and another new country, DXCC # 65, succeeded. Not easy to fight against so many well equipped multi-antenna-stations. Uwe, DG8NCO, did a really very good job and catched also weak signals out of the pileup. Another highlight was a QSO with IK1FJI, Walter, who also works with only one Yagi. This completed my first 1 Yagi – 1 Yagi Moonbounce contact. A total of more than 40 QSO’s and 38 initials were logged, a really great EME weekend. Listed details are here. There was a lot of work to be done in the garden during the last weeks: No, not only mowing gras, but also a larger hole had to be excavated and filled with concrete. Then mounting a stable metal pole on it, a rotor and, of course, another antenna. An 8m long 12 element DK7ZB Yagi was the choice, 14.1 dBd gain. Not much at all for a 2m EME system, but we’ll see what’s possible. On Saturday afternoon everything was ready to go for the first test. The automatic tracking system worked perfect and turned the antenna exactly to the moon, who was almost in the south. Just only 30 degrees elevation and almost 2 dB additional pathloss – not very promising. Will this be enough to hear someone? It was enough! 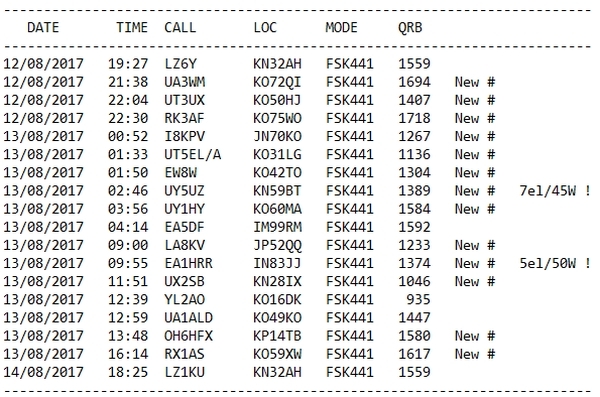 UA4AQL was easily detected in the waterfall, calling cq in JT65 mode. One periode calling and he came back to me – whow, what a good feeling! After this initial contact, four more QSO’s followed with LZ2FO, RX1AS, OH4LA and F4DJK. On August 18 – 20, 2017, the 19th Technical Convention and Meeting of the EME + Microwave Amateur Radio Group Poland was held in the new Hotel Morawa (JO80KG64LV) near the small town Stronie Slatskie. Stanislaw SP6ASD, SP6JLW and SP6OPN and Team organized a perfect meeting with interesting lectures and more than 100 guests. Presentations by OK1DFC (“1 kW SSPA for 23cm”), OK1UFL/OK1FPC (“47 GHz Transverters”) and OK1AIY (“24 GHz Transverter”) were only some of them. Practically Zdenek, OK1DFC, shows very impressive live 10 GHz EME activity with his portable 1.8m dish setup. A Flea market and Gala dinner were also important parts of this meeting. It was a great pleasure for me to meet old and new friends. Thanks for organizing this very nice weekend! Some more pictures and impressions are here. After more than 4 month (!!!) 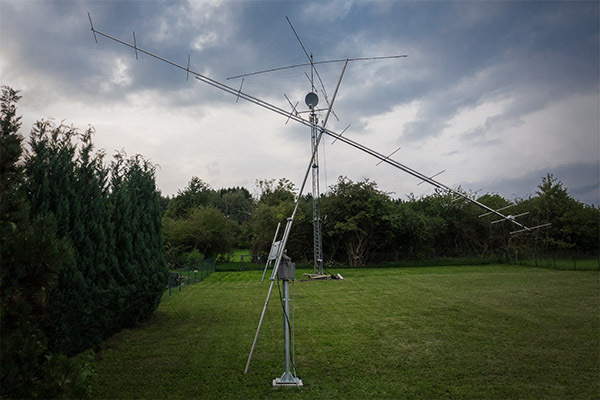 I received the ordered 12 element Yagi for 144 MHz (see the full story here). It’s a DK7ZB design, manufactured by “VPA-Systems” in Poland. Transportation from Poland to Germany by DPD was within 2 days, the parcel was abt. 2m long, good wrapped and received without any damage. At first look the antenna seems well made. Boom and support are of square-aluminium 20 x 20 x 2 mm, dipole 12 x 1 mm and elements of aluminium 10 x 2 mm. Mastclamp is for 50 mm tubes, no options. All holes are drilled correct and elements and boom parts are numbered. The box for balun and N-connector is made of hard plastic. Screws, nuts (self locked) and bolts seems V2A but not sure – we will see. Two packs with mounting material are included and assembling could be done within less than one hour. The balun is made of two 75 Ohm teflon cables Type RG 187 (diameter 2.6 mm). The cable is specified for a power handling of 1.400 W at 400 MHz. 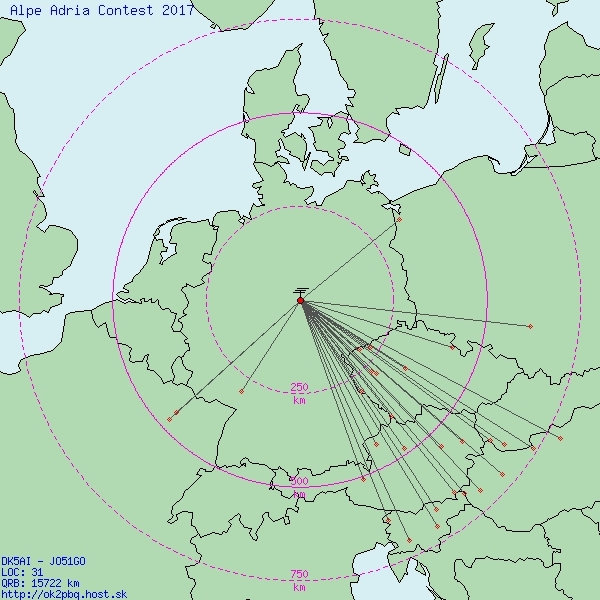 Beside some other commitments I found time to give some points during todays 144 MHz Alpe Adria Contest. Conditions seems quite normal and beside others, several S5 stations were worked. Just missing all the OK2/OK3 stations, not worked one! The final results are 31 QSO’s with abt. 15.700 points, average 491 km/QSO and todays ODX HG6Z (787 km).